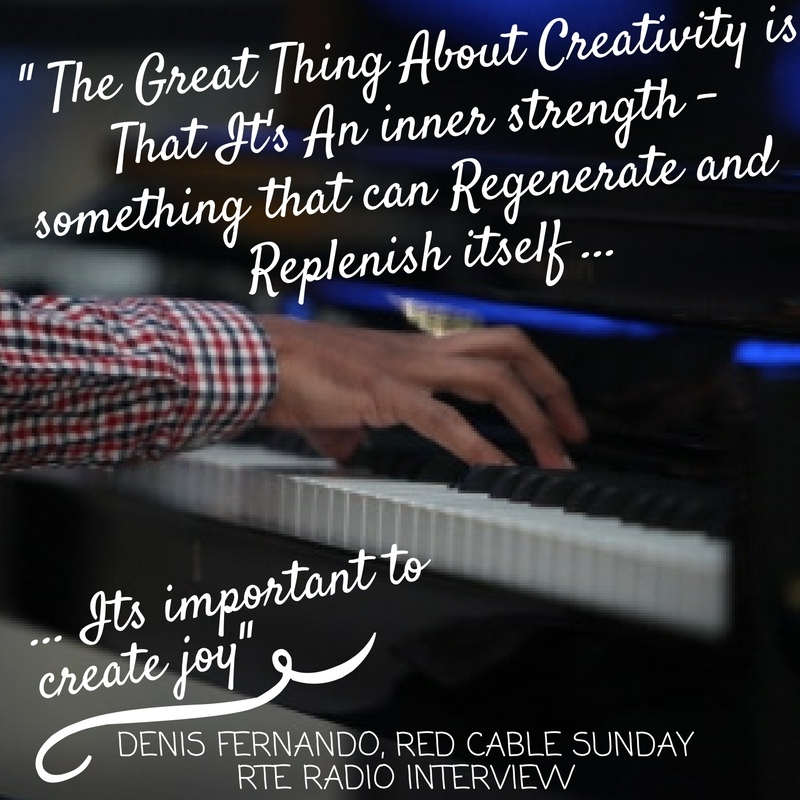 Red cable Sunday TheNews Uncategorized 2016 A Year in DIY Music : Bigger Better Brighter in 2017! This year has been one of many ups and downs – a turbulent year that has seen instability in the world and the loss of some renowned cultural icons including Muhammed Ali, Prince and David Bowie amongst others. I can only say that doing the music that I have been lucky enough to make has been like a golden thread shining bright through the otherwise bleak times. Some fantastic things have happened for me this year regarding it and they have all been reminders that regardless of the bad times, we should not forget our humanity, our creativity and the connection that this enables us to have with each other. 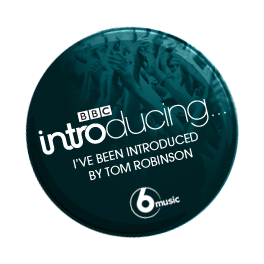 My latest single Relentless (as remixed by the fantastic Submeto) was also featured on BBC 6 Music for Tom Robinson’s Mixtape as part of BBC Introducing – You can hear Submeto’s Short Cuts Mix here I am delighted that all the singles that I have released so far have received some form of national media coverage or radio play. 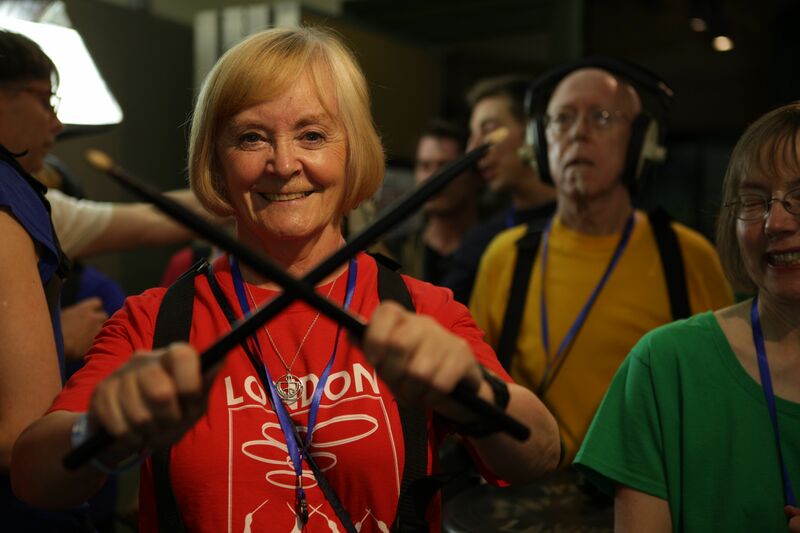 I was absolutely honoured to be a Pandemonium drummer in the Olympic Opening Ceremony of the London 2012 Games. 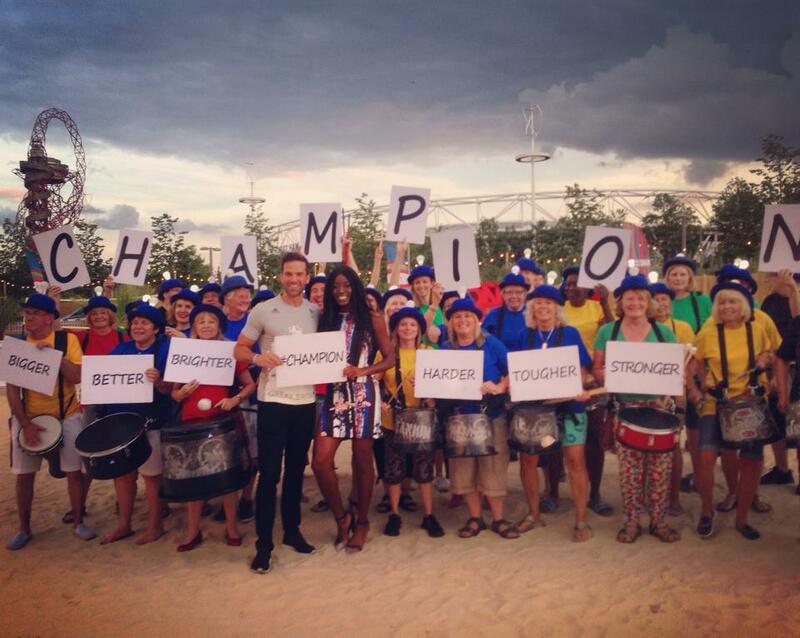 When I took part in the London Olympic Opening Ceremony I had no idea that it would change my life. I got the part of a drummer marshal and thought I would be cheering on the VIPs and the Athletes. I could not have imagined that ordinary volunteers would have been transformed by the roles we got to play in the ceremony. If you thought the ceremony was jaw-dropping, that’s the way we all felt when we first saw what part Danny Boyle and the ceremonies team had in store for us! 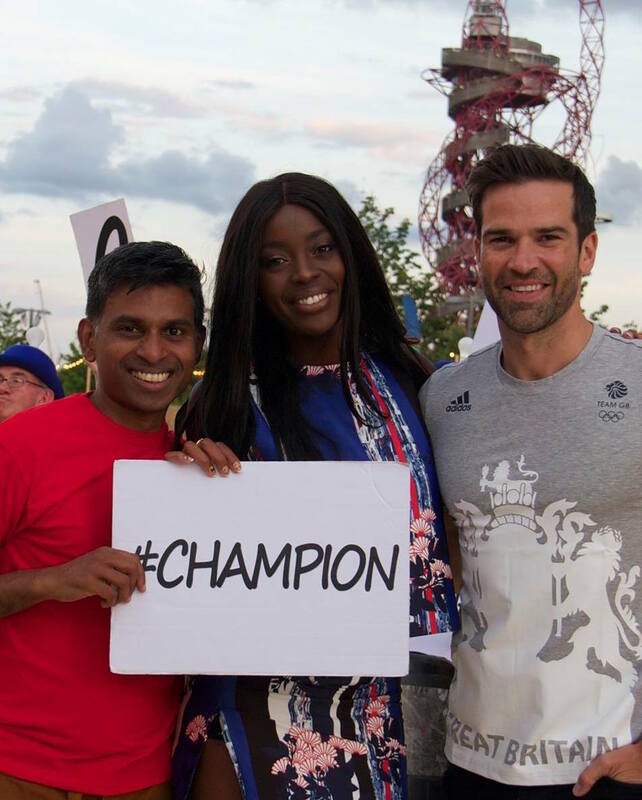 I got involved in the Olympics because I was so impressed that London won its bid by celebrating diversity and pitching itself as a world class city. I think that both this bid and the ceremony are a timely reminder that when we express the internationalist dynamics that are central to the success of London, we truly realise our potential on the world stage. It left a lasting impression on me and I have been part of the legacy of the volunteers from the games who have continued to dance, perform, drum and volunteer since the games. They are a true inspiration and an example of people power that should be at the forefront of changing society for the better – I can put it no better than the words of Frank Cottrell Boyce, writer of the opening ceremony who addressed a group of us volunteers and said that if the Prime Minister was serious about changing Britain for the better he would have invited us in to find out how. The Opening Ceremony was a hugely creative process. As a DIY Musican it was a formative experience to be watching this historically important cultural event come together. I was impressed at the bold, daring moves put forward by the creative team – we were playing buckets, not drums, entire segments were showcasing the anonymous cast of volunteers, whereas high profile VIPs such as the Queen and Mr Bean were getting comparative cameos in this show. Musically, it managed to pull together Elgar’s ‘Nimrod’, ‘Bonkers’ by Dizzy Rascal, a Jazzed up version of ‘Tubular Bells’ and a new piece of music ‘And I Will Kiss’, complete with industrial electronic breaks, all into a cohesive, emotional whole. It ran the gambit from tearful emotion to all out humour. It achieved the ultimate aim of keeping a British audience, who can be a difficult crowd, happy. 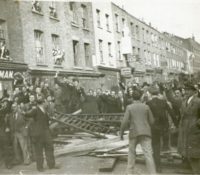 For me it was beyond national pride – I think it was fundamental human connection. And that was so important for the turbulent world that we were in at the time of the 2012 Olympics, and the world we find ourselves in now. I had thought that this year was going to be filled with a poignant last farewell to the Olympics, as we handed over to Rio and prepared to bid farewell to our time as the last city that had hosted the games. How wrong could I be. 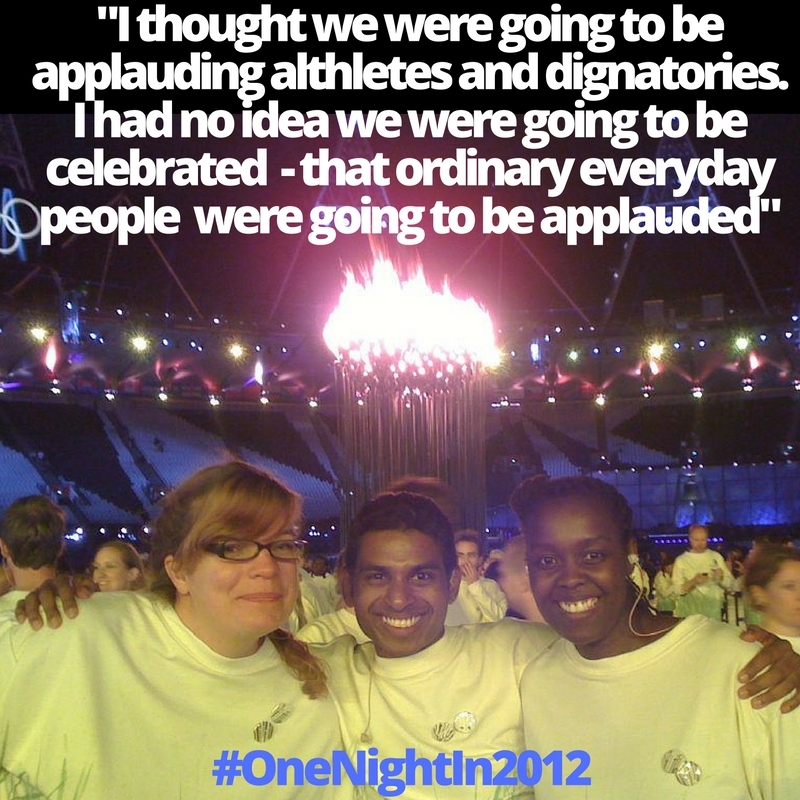 Firstly, I was delighted to be asked to be part of the Alan Yentob Imagine Documentary ‘One Night in 2012’ which was all about the stories of the volunteers – how we decided to take part in Danny Boyle’s spectacular ceremony, and a reminder that all was not positive about the games before they took place. In fact, the Opening Ceremony had a large part to do with turning that around and, as the documentary reveals, the can-do spirit of the volunteers gave a sense of energy and positivity to the creative team. When it was first shown, the documentary trended three times seperately on twitter and a constant theme from people was “I am more 2012 than 2016” A reminder that the ordinary everyday people of this country were part of a world wide event which threw its arms open to the international community and left people with a jaw dropping spectacle that continues to inspire today. 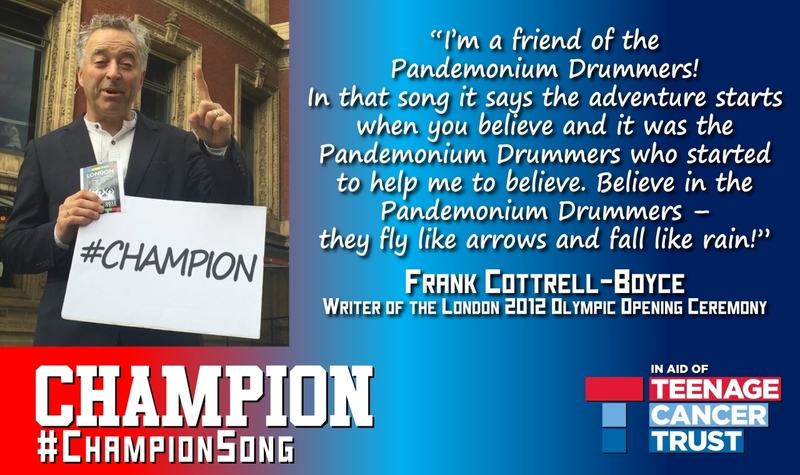 The Pandemonium Drummers were so inspired by the opening ceremony that we are still together 4 years and 150 gigs later! This has included the UEFA Champions League Final Opening Ceremony at Wembley Stadium, right through to small gigs for Crisis at Christmas. At one rehearsal, one of my drummer friends asked me if I had ever considered writing a piece of music for the drummers. 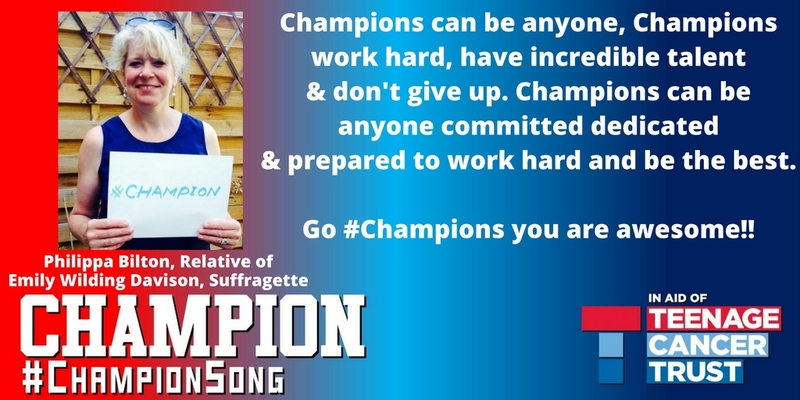 This had been buzzing around my head for the best part of a year when I came up with the track Champion. 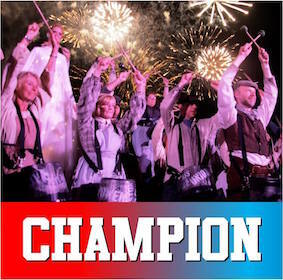 It was inspired by the moment the drummers shared after the industrial revolution sequence – after a quick costume change we were back on the field as the marshalls for the athletes, and witnessed up close the moment that the cauldron was revealed to the world and came together. What you dont see on the TV was that straight after this momement, the sky exploded into a shower of fireworks and I willl never forget the marshall who stood next to me, who had become a friend through weeks of rehearsals, let go of my hand (as we were a human chain) and wiped a tear from her eye. The cauldron represented the world coming together. And this was emanating from east london to a worldwide audience of billions. Its that priceless moment, when we felt as lucky to be there as all the Athletes that had worked so hard to get there, that Champion was inspired by. Even though the track was pretty much complete by the end of the summer of 2015, my uncle fell terminally ill with cancer and much of my days were taken up that summer with looking after him, followed by the shock and bereavement that we felt losing him, the last of a long line of my father’s siblings that we lost in quick succession to cancer. I put Champion on the shelf and just thought it was too late to make a go of it as releasing a single takes months of planning. However with two months to go before the anniversary of the opening ceremony, I called up the Tim Newman and Jan Pearson, the Chair and Secretary of the Pandemonium Drummers Committee and asked them if they would be interested in trying to get the track of the ground. To my surprise they said yes. They were surprisingly matter of fact and confident about my ambitious plans to engage a high profile recording artist, make a video and release the single. 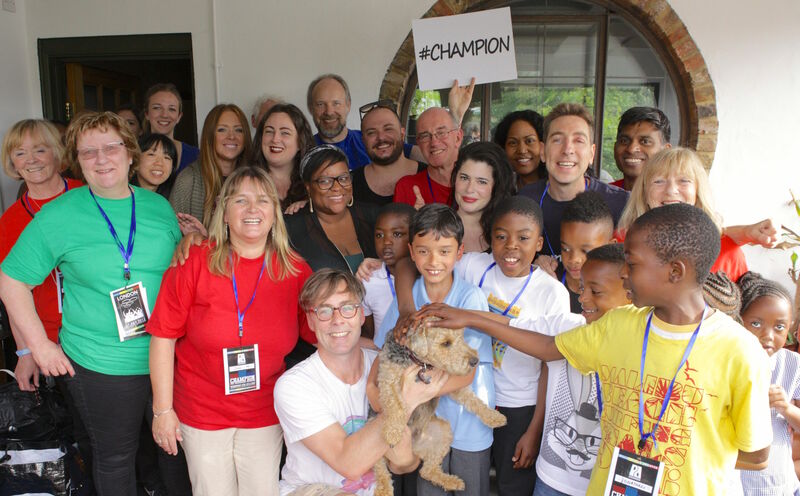 Over the next few weeks they and the Pandemonium Drummer Committee and Creatives would go above and beyond what anyone would expect, to make the release of Champion happen. Drummers Tim Newman and Simon Porter did an amazing job on arranging and mixing the demo. 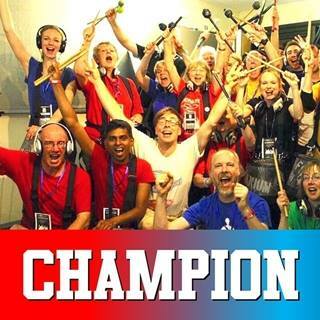 It was great to be working with other Pandemonium drummers on our own creative project. We decided to make it a charity single so that the true legacy of the volunteers was embodied in the release of the track. We already had a close relation with the late Stephen Sutton MBE, who bravely faced his last days in 2014 giving a ‘thumbs up’ to life. His bucket list wish of raising money for the Teenage Cancer Trust was resulted in a worldwide viral campaign that raised millions. 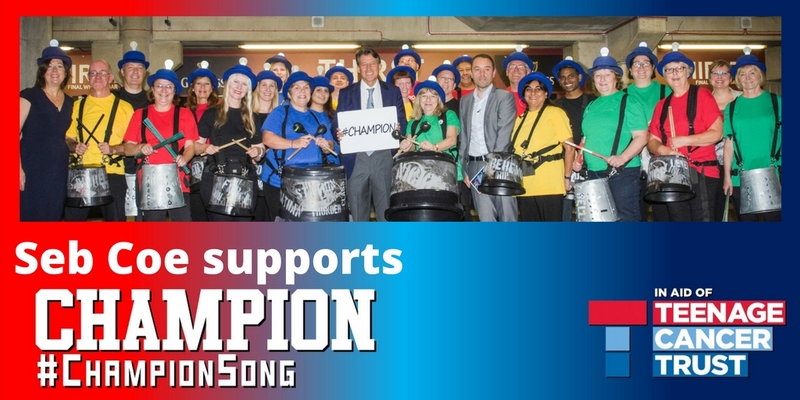 We had performed with Stephen at the UEFA Champions League Final which was fulfilling his bucket list wish to perform in front of a large crowd. And what a large crowd! It was this lust for life and dreaming big that left an impression on us long after that performance. We were delighted to perform at his fundraising ball that December, which was to coincide with his last Birthday. The drummers then were honoured to be asked by his mum Jane Sutton to be a part of his funeral Cortege when he sadly passed away in Spring 2014. 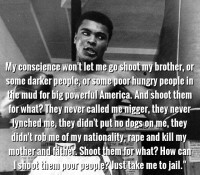 We never stopped talking about him and when this track came about we thought he embodied the idea of a Champion. Someone with courage who kept going, despite the odds, regardless of whether he would eventually win his battle. The lyrics of the track make no reference to a winner on purpose, because there are many everyday ordinary people who are soldiering on, and who may not win, but whose courage endures and without whom life would be much poorer. With all this in place Im really grateful to drummer Rob Blakemore for playing the track to Felix Buxton of Basement Jaxx who then agreed to be on board with producing and arranging the track. 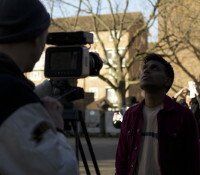 Though Felix did so much more, inviting Vula Malinga (who performs on Oh My Gosh by Basement Jaxx) and Brendan Reilly (who recently featured on a Disclosure track) involved, as well as the support we were given from the Basement Jaxx crew including engineer and performer Duncan Brown, manager Andrew Mansi and the final mix was done by Stuart Hawkes who mastered the Basement Jaxx Debut Album as well as other releases. On July 6th, Felix pulled together a hugely challenging day of recording which was about 7 hours back to back and involved solo singers, a children’s choir, an adult choir and two sessions of pandemonium drummers, he was constantly in good cheer, full of enthusiasm and willing to listen to the many suggestions which came in from all quarters, including one of the children wanting to beat box which introduces the track. He reconstructed my original track, putting the challenging sound of our drums (upturned buckets) centre stage on the track. 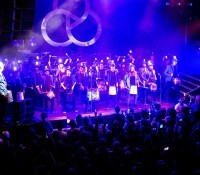 The drummers first met Basement Jaxx when were invited to perform on stage as part of their Peace One Day show to a sold out crowd of thousands at Koko in Camden in Autumn 2015. I was struck then at how the show was constructed with the same sense of togetherness and diversity that I witnessed in the opening ceremony. It was comfortable in its quick changes from a choir and ballerinas, to drummers, all interweaved by Basement Jaxx tracks which were celebratory and jubilant. I was delighted to have joined other drummers after our performance back on stage with Basement Jaxx dressed as a gorilla for an energetic work out of Basement Jaxx’s Where’s Your Head At? 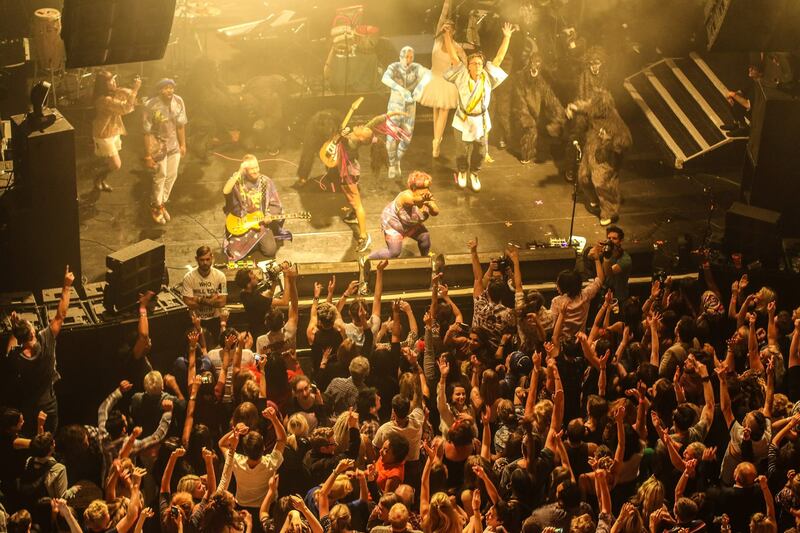 Pandemonium Drummers join Basement Jaxx on Stage as Gorillas – Where’s your head at? 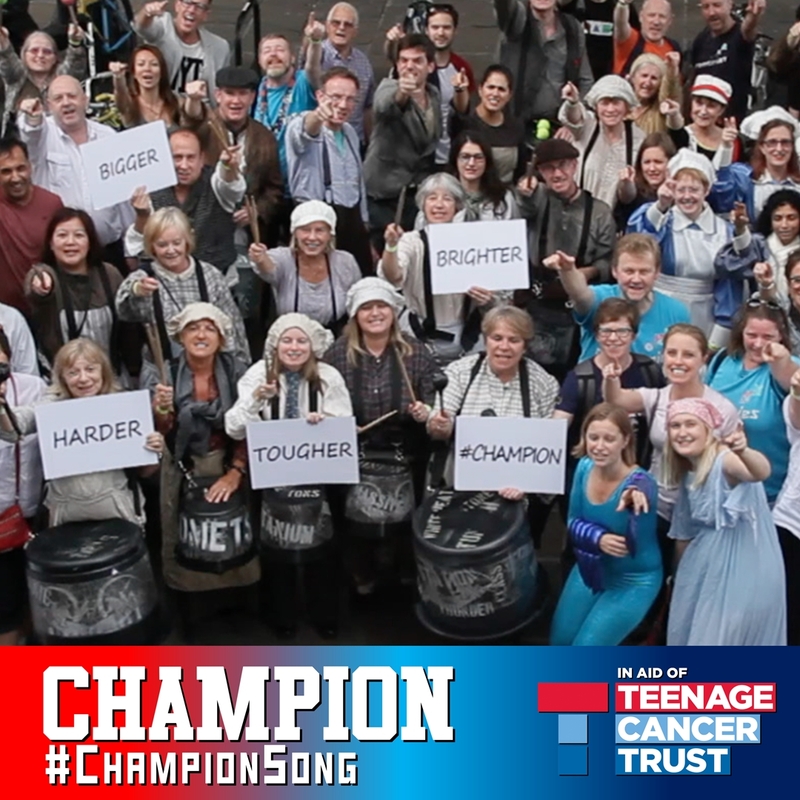 The other two singers who featured on the track were Melissa Cavanagh, who featured on The Voice as part of Team Boy George, and Gina Maloney, a service user from the Teenage Cancer Trust. We were keen to have service users central to this track. 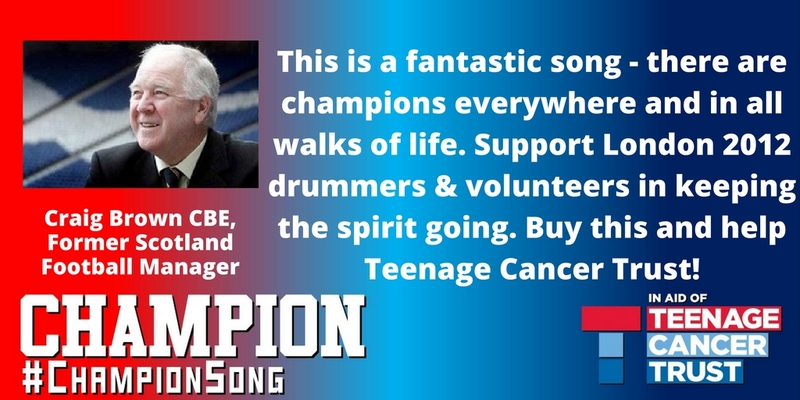 We are really grateful to the Teenage Cancer Trust Music and Entertainment Team and TCT’s Angie Jenkison for all their support for the track from getting us these fantastic singers through to giving the track coverage and support. There was something absolutely fantastic about the day of the recording taking place on 6th July, the anniversary of London winning the bid in 2005. Many of us could not have dreamed that so many years after winning that historic bid we would be working with members of Basement Jaxx on a recording like this! 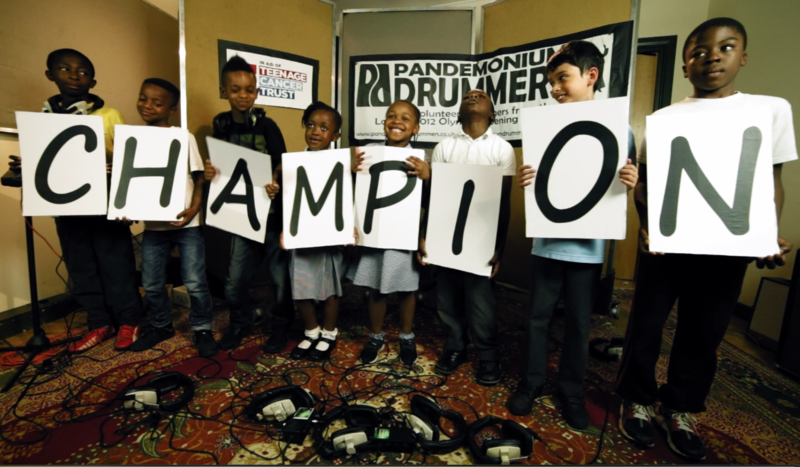 It was a brilliant experience for the pandemonium drummers to be recording our first ever single – some of whom had never been in a recording studio. Of course given our crushing deadline of getting the track released a mere 21 days after the recording meant that all the design work and the video had to be done at the same time. For this I have to say a special thank you to Pandemonium drummer Dan Spence who banged out amazing visuals and a fantastic cover often with little or no notice. I also have to thank Freya Parsons and Sheri Sadd of Elite Squad London who helped us find some fantastic video crews including Everlock Productions, Fran Freeman Tom Moore and were on hand for whatever challenge the days in the countdown threw us. From discussions about a stepladder at 3am one saturday morning for a particular shot of Olympic volunteers in ceremony costumes outside a cinema, to zipping files across across London to help us get the video done in time. Do we need a step ladder for this shot? Do we need to sort this out at 3am? The most Rock n roll conversation I have had in my entire career as a musician! With the track out and released in good time for the Opening Ceremony anniversary, we were able to get coverage on BBC, SKY, ITV and London Live. 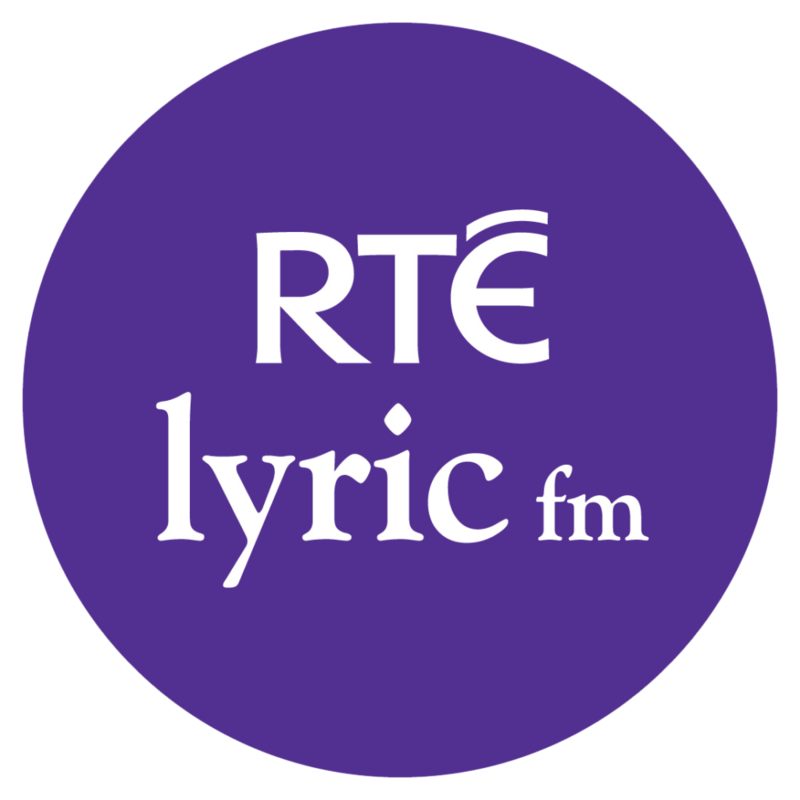 A special shout out to all the drummers who took part in the interviews and the behind the scenes PR Team and Project co-ordinators who made this happen, as well as the great advice of Nanette Rigg, Freya Van Lessen and Lynne Walsh as well as Derek Moore / Dave Natriss who kept track of all the tv appearances for us. 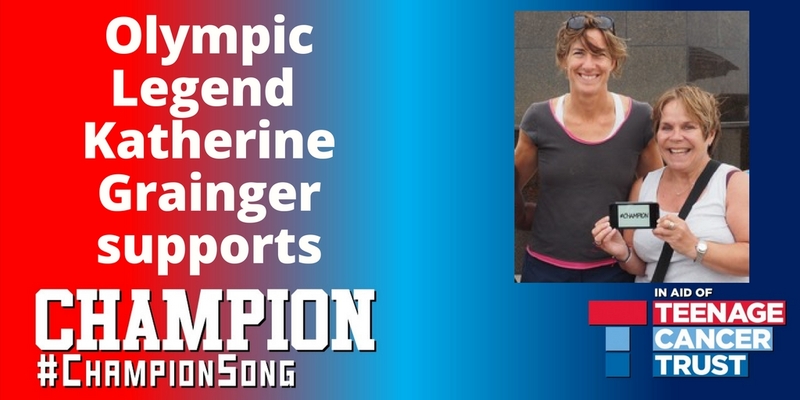 As the action moved to Rio, we were delighted to have drummers like Helen Isaac out in Rio, doorstepping Clare Balding, Katharine Grainger and Jan Pearson and Vera Yu in London doing the same to ensure that we were getting Olympic Champion support for the track! Another pic from Rio thanks to drummer Helen Isaac! 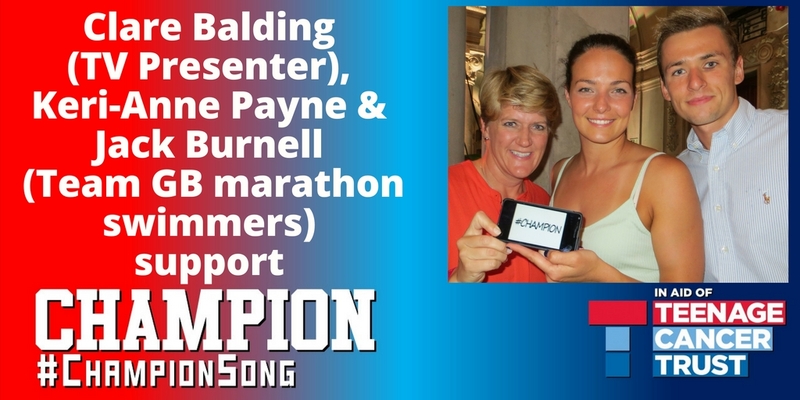 One of the most touching and special experiences of this track was the support given to us by Stephen Sutton’s mum Jane Sutton and her partner Tracey Spare. From the moment we reached out to Jane with the idea of the track we received nothing but energetic enthusiasm for it. We were delighted that she agreed to be in it and allowed us to use Stephen’s image in a dedication. On the day it was released I was moved to receive a call from Tracey reminding me that Stephen had wanted to release a charity single as one of his bucket list wishes. 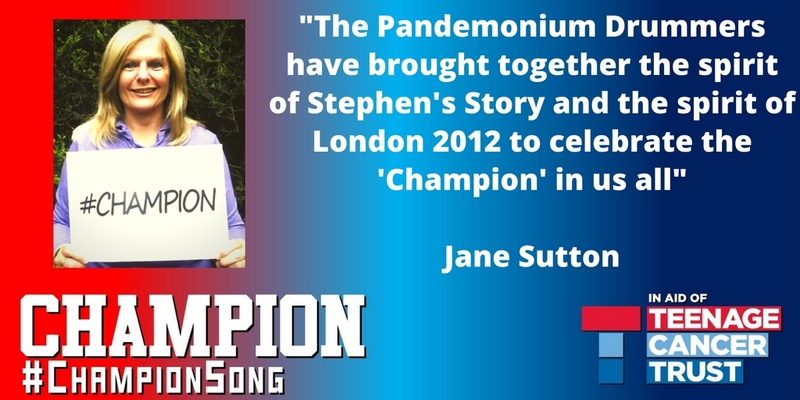 Over the subsequent weeks and months, Jane and Tracey promoted the track on Stephen’s Story social media which has a reach of millions. 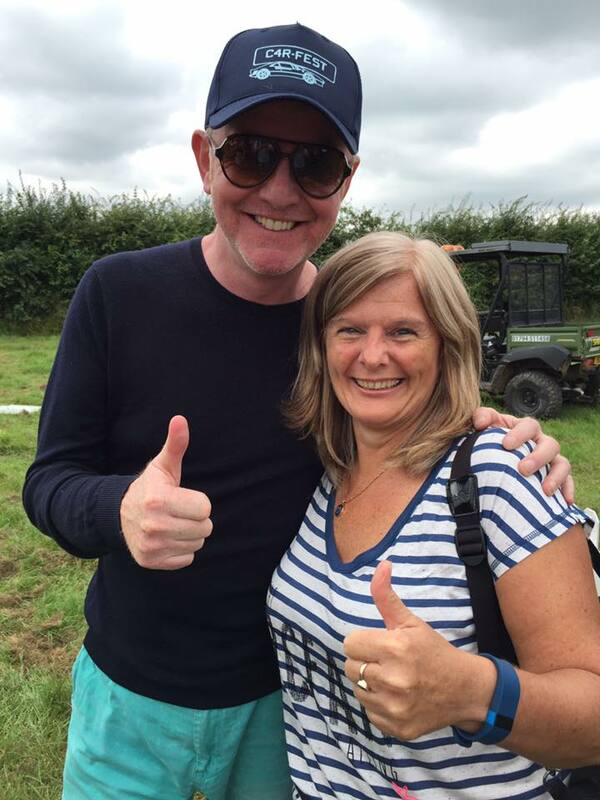 Jane announced the track to tens of thousands of people at the Carfest North Festival, plugging the track to Chris Evans, ensured a CD of the track was given to Simon Cowell at the Pride of London awards and made the track part of her sponsorship campaign for climbing Mount Kilimanjaro which raised over £15,000 for Teenage Cancer Trust. 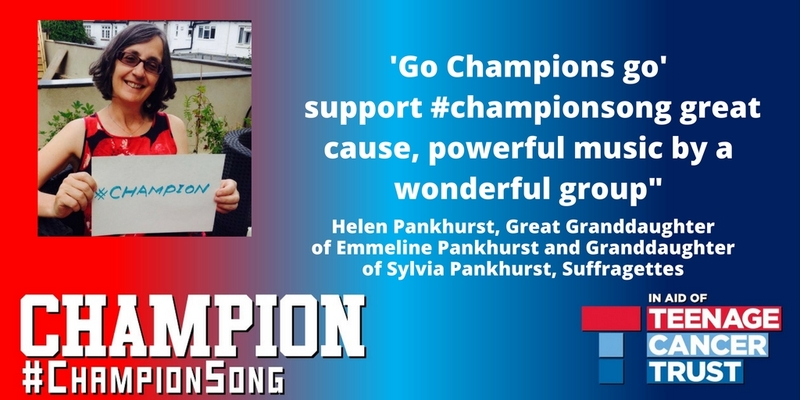 We were delighted to be reunited with Jane and Tracey at the Teenage Cancer Trust Know Your Sense of Tumour conference for service users in autumn, where Jane presented us with the Champion flag that had been up Kilimanjaro. They both took part in the workshop which saw young people learn the beats to Champion only to discover they were then going to perform it to the hundreds present at the gala dinner that evening! They made for a very dynamic, loud set of drummers, who picked up the beats quicker than many of us had during the olympics! Our latest performance of the track was to hundreds of delegates at Team London’s international volunteer conference in City Hall London. 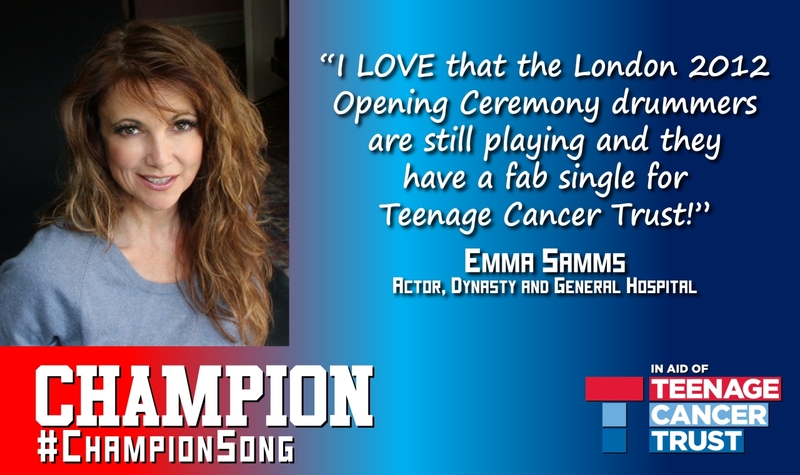 I would like to personally call out and thank the many many people who made Champion possible, within the Pandemonium Drummers, Dancers and other Olympic volunteers, Teenage Cancer Trust, Stephen Sutton’s Family, the Basement Jaxx Family and performers, the choirs and school children, the behind the scenes crew including video filming and editing, PR, The many high profile celebrities who lent their invaluable support to the track from Scott Mills (Radio 1) and Chris Evans (Radio 2) to Seb Coe, Clare Balding and the many Olympic Athletes, to Gethin Jones, AJ Odudu, Joe Wicks, Emma Samms, Louise Jameson, Naturally 7 and many others who can be found on the drummers’ social media @2012drummers – I know if I try to name them all I will forget someone! 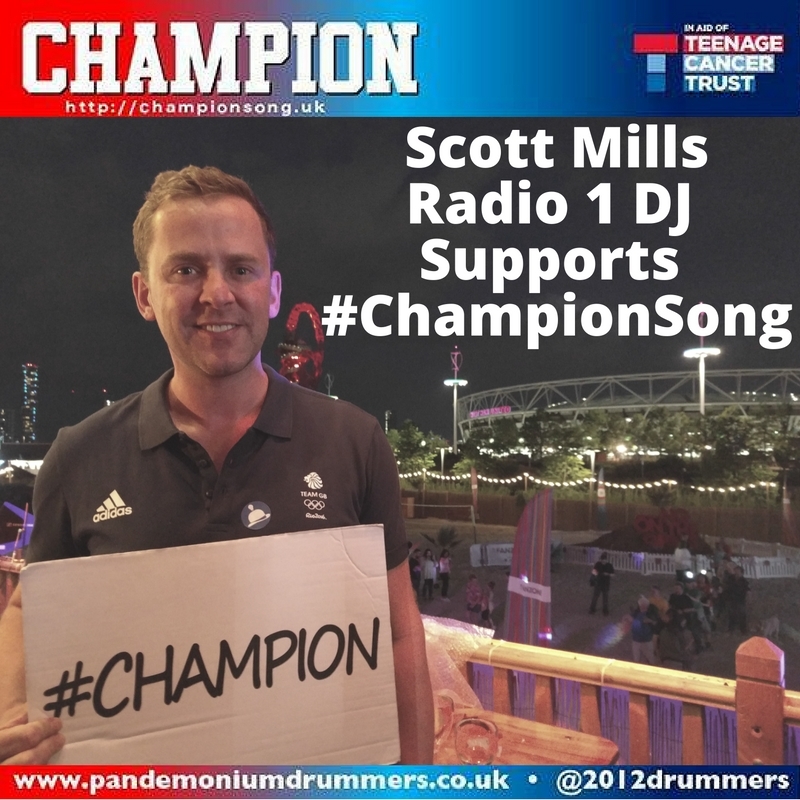 The credits for the track are all listed here and they all gave their time for free to make this happen and continue making Champion a central part of what the drummers do for which Im really grateful. It simply could not have happened without them. The media reach for Champion and the achievements it made have, in six weeks been the stuff of dreams for a DIY artist like me, who could not achieve these kind of results in 10 years of recording, producing and promoting new original music. The track went from a file on my soundcloud page to a complete track ready for release with a full video in a mere 6 weeks. That was the result of people pulling together with a common aim and going above and beyond to make it happen. The Project team co-ordinators, creatives and committee all saw this as a labour of love and went at it like professionals on the job even though they were all volunteers. As a result we got to spend our last Olympic Anniversary not just reminiscing and remembering the good times from four years ago and events that have happened since, but also looking forward to the future. I would like to think that the experience of being so integral to the Opening Ceremony, which was an explosion of creativity itself, with ordinary people put centre stage, gave us the courage and creative spark to continue in many ways. As a result, this does not in any way feel like the end of the road for us, but the beginning of a brand new chapter.